I have all four of Janet Arnold’s “Patterns of Fashion” books. Since I stopped making costumes, I haven’t had much use for them except to look through them and dream. Then the other day a thought occurred to me. I might not be able to wear the dresses as street clothes, but some of the pretty designs I could make as loungewear, or even a nightgown. I love the dolman sleeves and collar on the 1915 dress below. I think I could transform it into something I could wear around the house. Ms. Arnold put so much work into her amazing books. 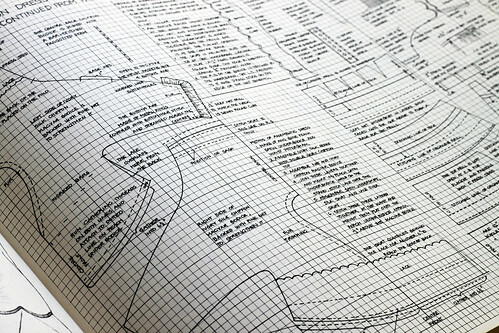 The shapes of the pattern pieces are drawn to scale. 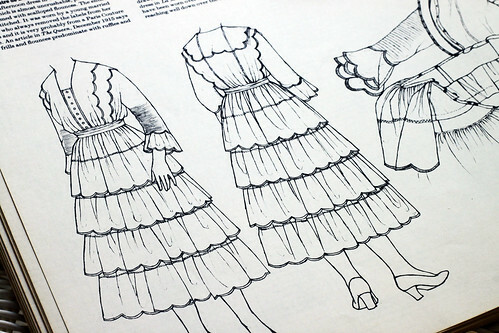 Since the patterns are taken from actual historical garments, they would have to be re-drafted to fit a modern figure. This entry was posted on Wednesday, September 23rd, 2009 at 3:00 am and is filed under Book. Tagged: Book. You can feed this entry. You can leave a response, or trackback from your own site. I can see a kids twirly skirt made out of it too!